Faisal Masud MD, FCCP, FCCM is the medical director of critical care at Houston Methodist Hospital, vice chair for quality and patient safety, and medical director of the cardiovascular intensive care unit at Houston Methodist DeBakey Heart & Vascular Center. 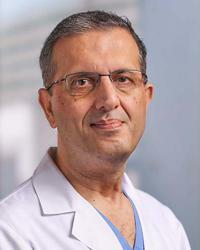 He also serves as professor of clinical anesthesiology at Weill Cornell Medical College and professor of anesthesiology at Houston Methodist Institute of Academic Medicine. He currently is the associate quality officer. Dr. Masud has been the recipient of the Golden Apple Award for excellence in teaching four times since 1999. He received the Dean H. Morrow Resident Mentor Award in 2001 and the most prestigious Fulbright & Jaworski Faculty Excellence Award in educational leadership in 2004. In that same year, he was elected a member of the Academy of Distinguished Educators at Baylor College of Medicine. In 2010 he received the Association of Professional in Infection Control (APIC) national award for heroes in infection prevention. In 2014 he received the John W. Overstreet, MD, Award, given each year to a physician at Houston Methodist Hospital who exemplifies the best of the medical profession. He has many research projects, publications, and is an invited faculty at multiple local, state, national meetings and international conferences.